Technology convergence is a trend with more and more features being integrated into mobile device. While you may have all the necessary feature sets such as WiFi, GPS, Accelerometer and so on, but one useful feature that seems to be still lacking is the pico projector embedded into mobile device which could be best fitted for business executives and professionals. In order to fulfill such requirements, Samsung Electronics, a leading Korean based mobile maker has recently announced a new AMOLED display mobile phone featured with advanced beam projector to extend mobile devices usability suitable for foils sharing, business presentation and greater multimedia experience while on the move. 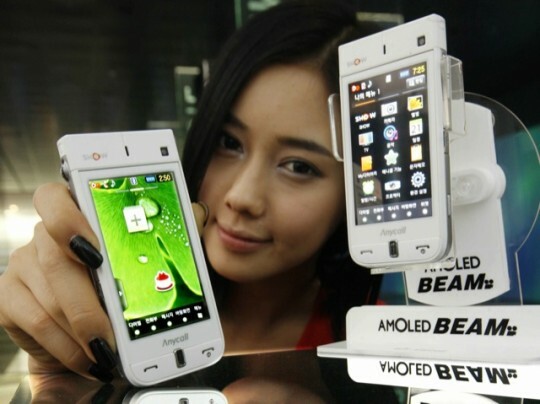 Named as AMOLED Beam, or SPH-W9600, the next generation mobile device is being equipped with 3.3-inch WVGA display and further supported by 5-megapixel camera module, it is not doubt a great multimedia companion. Besides, it has built in Terrestrial DMB tuner that allows digital TV viewing on its AMOLED, which is claimed to be 1.5 times brighter than previous Haptic Beam model. Some other features include the Bluetooth 2.0 + EDR, HSDPA, built in camera for video call, an internal 11GB with expandable memory card support of up to 16GB and many more. All these are well packed into a tiny 116 x 56 x 15.7mm lightweight and compact form factor design. More importantly, its integrated 9 Lumen pico projector with ability to project anything, regardless if there are still images, media playback or Microsoft presentation with up to 50-inch images on the wall is definitely a great selling point and major differentiation as compared to other competitors’ products. No actual pricing and availability yet, AMOLED Beam is one of the flagship models that could potentially trigger more handheld devices with useful Pico Projector designed in from other mobile manufacturers in short future.